This documentation may be revised in response to updated annotation guidelines and addition of new enhancements to the curation tools. Feedback is welcome; please add suggestions to the go-annotation or noctua github trackers for questions about modeling or the curation tool, respectively. 1.2 What is a simple GO annotation? 1.3 What is a GO-CAM model? Noctua is a web-based, collaborative GO annotation editor. 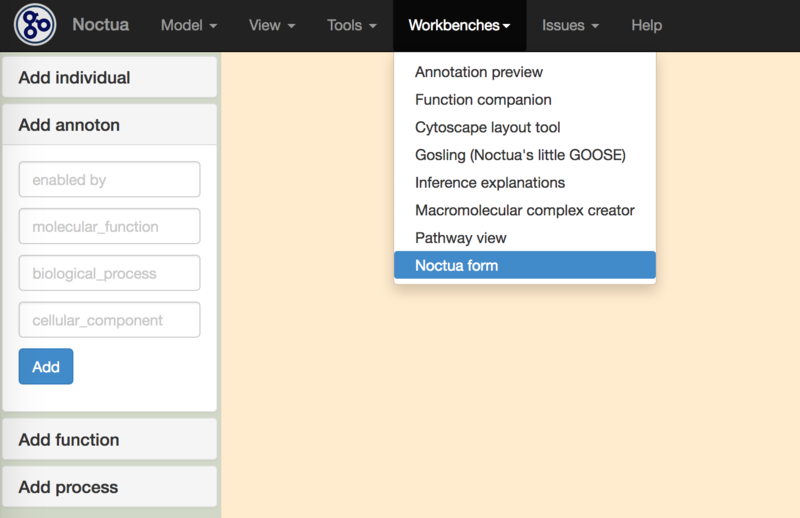 While creation of simple GO annotations is supported, Noctua was designed to enable connecting GO annotations, thus enriching the expressivity of the annotations and presenting a more complete picture of biology. Models produced with Noctua are called GO-CAM models. The overall goal is for each model to represent a unit that corresponds to a biological pathway. This document describes how to make GO-CAM models using Noctua. What is a simple GO annotation? A simple GO annotation is a gene product associated to a GO term, using an evidence code and a supporting reference (a primary research article, for example). The GO term may come from any of the three aspects of the GO: Molecular Function (MF), Biological Process (BP), or Cellular Component (CC). Gene products can correspond to proteins, complexes, or non-coding RNAs, and must be represented by a stable identifier. Gene identifiers may serve as representative of one or more gene products. What is a GO-CAM model? A GO-CAM model is a combination of simple GO annotations to produce a network of annotations ("model"). Minimally, a model must connect at least two simple annotations. The primary unit of biological modeling, or annotation, in GO-CAM is a molecular activity, e.g. protein kinase activity, of a specific gene product or complex. A molecular activity is an activity carried out at the molecular level by a gene product; this is specified by a term from the GO MF ontology. GO-CAM models are thus connections of GO MF annotations enriched by providing the appropriate context in which that function occurs. All connections in a GO-CAM model, e.g. between a gene product and activity, two activities, or an activity and additional contextual information, are made using clearly defined semantic relations from the Relations Ontology. One major difference between simple annotations and GO-CAM models is that the former does not have explicit relations between the gene product being annotated and the GO term. In GO-CAM models, using defined, semantic relations allows us to capture how a gene product’s molecular function relates to other aspects of GO. GO-CAM explicitly defines the relationships between: 1) different aspects (MF, BP, CC) of each gene product as defined in GO, 2) the combined functions of different gene products (“pathways”), and 3) different systems of interacting functions (“modules”). The basic structure of a GO-CAM model is shown in Figure 1. Fig. 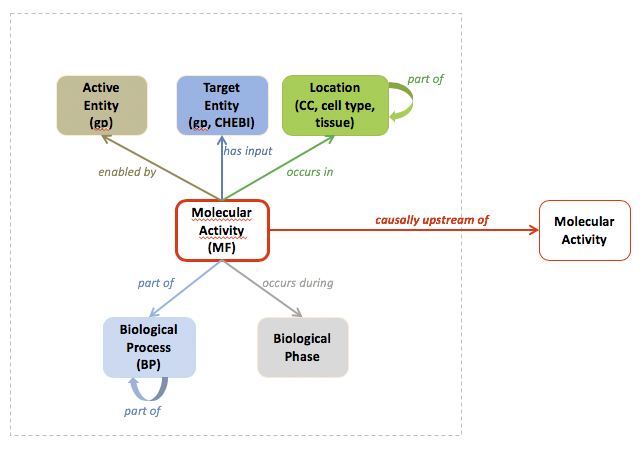 1 Basic GO-CAM activity node (MF annotation), showing the relations to other elements of the model (CC and BP annotations, as well as additional information). a molecular activity may act upon another “target” molecule, this can be specified using a gene product identifier (for a protein or a gene) or a term from the ChEBI ontology (for a small molecule). In this case the MF is qualified with "has input [target_id]. a molecular activity occurs in a location: this includes cellular structures (described by a GO CC class (i.e. term), excluding the “macromolecular complex” branch), which can be further nested within larger structures using the appropriate cell and anatomy ontologies. a molecular activity is part of (i.e. helps to accomplish) a biological process, i.e. a biological program that also includes other molecular activities, which is described by a GO BP class (i.e. term). In turn, a biological process can be nested inside an even larger biological process. if the molecular activity occurs during a particular biological phase (e.g. a particular stage in organism development), this can be specified using a term from an appropriate ontology; i.e. any descendant of the term “GO:0044848 biological phase”. a molecular activity may also have upstream, causal roles with respect to a process, "acts upstream of" or its precise relationship to a process may not yet be known, in which case the relation would be "acts upstream of or within". Each of these relations may further be qualified by indicating a positive or negative effect, e.g. "acts upstream of, positive effect". Once the GO-CAM unit has been created (MF+BP+CC), these different units can be linked to each other to represent a causal activity model. The most common relations are directly (positively/negatively) regulates and provides input for, but there are other relations of greater and lesser specificity, depending on what is known. Regulates should be used to denote biological control of a downstream activity. Provides input for should be used when there is no control, but an upstream function creates a molecular entity that is the target of the downstream function, such as in a metabolic pathway. We recognize that the knowledge of biology is incomplete; in cases where some or most of these aspects are unknown, a model may still be constructed with details added as more information becomes available. Users should attempt to specify functions as fully as possible, but partial models are expected and still contribute to the GO knowledgebase. A web browser; Chrome is recommended. Fill out the online new user form and contact sjcarbon at lbl dot gov once complete. Propagating the metadata information may take a little time, so please do this as early as possible. If you don't already have a GitHub or ORCID account, please obtain these before continuing (note that in exceptional circumstances, it is possible to use Noctua without these). Need at least high-level overview of how NEO is constructed. GO-CAM models may be viewed without logging in to Noctua, but if you wish to create new annotations or make edits to a model, you must be logged in. To log in, click on the Login button in the upper right corner, and on the resulting page click on "Sign in with Github." When you are signed in, press the "Return" button to return to the Noctua landing page. 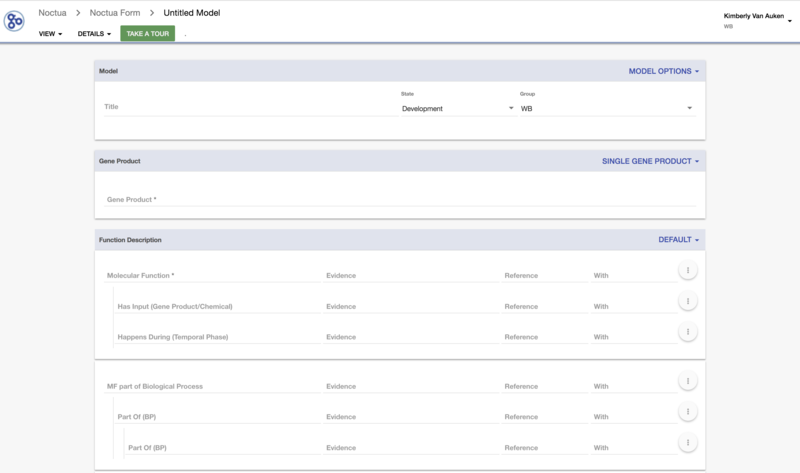 The existing models list can be filtered using the search box just above the list of available models. Currently, models may be searched by title or the orcid of anyone who has contributed to the model. Tip: You must be logged in to see the two options for starting a new model. Default - use this form to make a statement about a gene product's activity when that activity is an integral 'part of' a biological process and that activity 'occurs in' a specific cellular component. CC only - use this form to make cellular component annotations only for a gene product when you do not want to make a statement about the gene product's activity in those locations. BP only - use this form to make biological process annotations when you wish to relate a gene product to a biological process when its activity is not an integral part of that process, e.g. the gene product affects a biological process but the underlying mechanism for its action is not known. The Graph Editor allows curators to make any type of annotation, but does not provide task-specific 'templates' and does not have all of the annotation shortcut and search capabilities of the Form editor. The Graph Editor is used to link individual annotations entered via the Form interface to create more connected, or complex, GO-CAM models. While working on a GO-CAM model, curators may wish to go back and forth between the Form editor and the Graph editor; this can easily be accomplished through the respective form menus. From the Form editor, select View > Graph editor to enter the Graph editor (Figure 2). The graph editor will open in a new browser window. From the Graph Editor, select Workbench > Noctua form (Figure 3). The Form editor will open in a new browser window. Note: This section will need updating as the new Form for annotation review and editing comes on board. From the Noctua homepage, click on the blue "Edit" button in the rightmost column of the model table (Figure 1). This will take you to the Graph Editor view of the model, where you may make changes to your annotations. More information about how to edit an existing model can be found in the section on Editing a model below. Curation note: Wherever possible, curators should try to build on an existing GO-CAM model, rather than create separate models for each paper curated. This will allow the set of GO-CAM models to provide the most accurate, up-to-date view of a given Biological Process. To start a new model using the Noctua form, click on the 'Create new model in Form' link found on the Noctua homepage. This will take you to the annotation Form where you can add model metadata and create GO annotations (Figure 4). In addition to the GO annotations that you'll make, each GO-CAM model has specific metadata associated with it, e.g. a title, production state, and curator group. Curation note: Currently, curators can add any text to create a meaningful title to their model, e.g. species, biological process, PMID, etc. In the future, however, we may converge upon minimal standards for model naming. By default, all models begin in a "Development" state. When ready, models may be moved to a "Production" state for publication by clicking on the grey downward-facing arrowhead, and selecting "Production" from the dropdown list. Development models will not be published on geneontology.org and resulting "conventional" annotations derived from development models are NOT included in the derived GPAD file. Some GO curators perform annotation for more than one group, e.g. if they are funded by more than one project. Annotation groups are associated with curators in the users metadata file described above. By default, the first group associated with your entry in the metadata file is the group listed in the form. If you belong to multiple groups, you can select the appropriate group for your current work by clicking on the grey downward-facing arrowhead, and selecting the appropriate group from the dropdown list.. Currently, there are three different curation templates available in the Form: Default, BP only, and CC only. The Default template is used to create annotations when the curator is confident that the molecular activity (Molecular Function, MF) of the gene product is an integral part of a Biological Process (BP) and that the Cellular Component (CC) is the location in which the activity occurs. The Default template can also be used to annotate combinations of MF, BP, and CC, but the curator must always enter an MF annotation and understand that they are making explicit statements about the relationship between that activity and the BP and/or CC, i.e. the MF is an integral 'part of' the BP or the MF 'occurs in' the CC. If you're not sure that this is the statement you want to make, you can use the BP only or CC only forms to make your annotations. To help guide curators in understanding the statement that they're making, relations between ontology terms are shown in the field where that term is added. The CC only template is used to make cellular component annotations for a gene product specifically when you do NOT want to make a statement about the gene product's activity in those locations. The BP only template is used to make biological process annotations when you wish to relate a gene product to a biological process but its activity is not an integral 'part of' that process, e.g. the gene product affects a biological process but the underlying mechanism for its action is not known. Curation note: When making annotations in the form, try to fill in as many fields as possible, by typing in the field, and then selecting from the autocomplete suggestions by moving the mouse over your selection and clicking on it. Tip: In the autocomplete, enter a space after a complete word, to narrow down the choices. By default, the form allows you to enter a single gene or gene product. To select the desired entity, start typing and then select the desired entity from the relevant matches returned. You can type in the gene symbol, e.g. Wnt3a or the unique identifier or accession, e.g. UniProtKB:P56704. If necessary to narrow down the choices, type a space after the symbol, and enter the three letter code for the species (first letter from genus and two from species name, e.g. mmu for Mus musculus). Each entry in the autocomplete will also show the associated unique database identifier or accession, so curators can confirm that they are selecting the appropriate entity for annotation. For the default version of the form, these three fields are required. If the Molecular Function is known, enter the appropriate GO term, evidence code, and reference (you can add multiple pieces of evidence by clicking on the "..." button to the right of the fields, and selecting "More evidence"). Alternatively, you can select an existing annotation+evidence from the GO annotation database, by clicking on the "..." button to the right of the fields and choosing "Search database". With this option, you can select multiple annotations to the same term, which will add evidence from all selected annotations. Curation note: Wherever possible, curators should use a PMID as a reference, e.g. PMID:29802214. If a PMID is not available, curators may use, in order of preference, a doi or an internal database paper identifier. Curators may also use a reference from the GO Reference Collection. has_input(molecule): fill in the "has input" field, evidence, and reference. happens_during(biological phase): fill in the "happens during" field, evidence, and reference. Additional BP part_of "extensions" can be made to provide contextual information to the BP term. Additional part_of "extensions" can be made to provide contextual information about cell and/or tissue type. We recommend that you fill in as many fields as possible before creating the activity, as after it is created, you will need to edit it from the graph canvas, which requires more steps to do. Press the SAVE button. A new activity will appear on the graph canvas (the main window). 1. Each new activity will appear on the same part of the canvas, so if you add more than one activity you will need to move them around on the canvas (by clicking and dragging) to see the ones underneath. 2. If the SAVE button is grayed-out, there is some information missing from the form that you still need to fill in. You can press the "why is the save button disabled?" for a list of missing fields. Fig. 6 Selecting existing evidence to clone. Fig. 7 Adding more new evidence. Once you have added an activity to a model, you can continue to add information to that same model using the Noctua form. Just as for the first activity, add the new gene or gene product using the autocomplete menu. Add the corresponding Molecular Function for the entity you wish to annotate. At this point, it is helpful to know of some additional features of the Noctua form that can save time when adding to an existing model. Clicking on the circle icon at the far right of an annotation row will bring up a menu of options for adding information to your model (Figure 5). At the top of the list are the three options for adding more evidence. To clone evidence, click on the 'Clone Evidence' text. A pop-up window will appear listing all of the evidence that is currently used for annotation in your model (Figure 6). From the window, you may check one or more specific pieces of evidence to add to the new annotation you're making. You may also use the box at the top of the list to add all of the existing evidence to the new annotation (although as models grow in size, it is unlikely that you'll want to do that). Note that the Clone evidence functionality can be used to also add evidence from an existing annotation in the GO database if an annotation to the term selected already exists. In this case, click on the 'ADD FROM EXTERNAL' text and select one or more lines of existing evidence to add to the new annotation in your model. To add more new evidence to an annotation, click on the circle icon at the far right of the annotation row and select 'More Evidence'. A pop-up window will appear where you can click on the blue 'ADD' text and a new evidence row will appear where you can add additional pieces of new evidence for your assertion (Figure 7). To add 'ND' evidence to a root node annotation, click on the circle icon at the far right of the annotation row and select 'Add ND Reference'. The 'ND' evidence code and correct GO reference (GO_REF:0000015) will be added as evidence to your annotation. Note that using the 'ND' evidence code in a GO-CAM model makes the same statement as for 'conventional' annotation: the curator has thoroughly reviewed the literature and there is no information known about the given aspect of GO for that gene or gene product. Although the form only shows the first piece of evidence added to a given annotation, if there are multiple pieces of evidence on an assertion, the total lines of evidence, and a link to all evidence, will be displayed above the evidence code box (Figure 8). Fig. 8 Display of multiple evidences. If you are annotating using the Noctua form and wish to begin a new model, you can do so using the 'Model Options' dropdown menu. When you start a new model, the model ID in the URL in your browser will change. This is a good way to check that you have definitely started a new model. Once you have created at least two activities, you can specify the causal relations between them. This is done on the graph canvas, by dragging from the blue circle of the upstream activity box, onto the downstream activity box (Fig. 3). You can then select the relation. Relations that are “direct” mean that there is a physical interaction mediating the effect on the downstream activity. Fig. Making causal relations between activities. Receptor ligand activity enabled by Wnt1 directly positively regulates receptor activity enabled by Fzd1 (Wnt1 binds to the Fzd1 receptor and activates it). Glucose-6-phosphate dehydrogenase activity of GAPDH directly provides input for for phosphofructokinase activity of PFK2 (the small molecule output from the GAPDH activity is acted upon by PFK2 as the next step in the metabolism of glucose). Small molecules can be substrates (inputs) of activities, created by activities (outputs) or modulators of activities (regulatory). In these cases, GO-CAM models make explicit nodes representing small molecule concentrations. To add a small molecule to a model, use the "Add Individual" item on the left of the graph canvas. These should have CHEBI identifiers. a small molecule in a metabolic pathway: in this case, connect the upstream activity (e.g. hexokinase activity) to its output (glucose-6-phosphate) using the has_output relation. Then connect the small molecule to the downstream activity (e.g. phosphoglucose isomerase activity) using the has_input relation. regulation via a small molecule intermediate: in this case the downstream activity must be a compound function, i.e. you will need to create TWO DISTINCT activities for the same gene product. The first activity must be X binding, where X is the small molecule. The second activity is the regulated activity. Connect the upstream activity to the small molecule using has_output, and the small molecule to the X binding activity using has_input. Then connect the first activity of the compound activity to the second one using a directly positively regulates or directly negatively regulates relation. ADCYA1 creates cAMP, which is an input to the cAMP binding function of PKCR1. The cAMP binding function of PKCR1 then directly negatively regulates the protein kinase inhibitor activity of PKCR1. ADCHE1 breaks down acetylcholine, which directly binds to ACHR1 (acetylcholine binding) and activates its GPCR activity. Similarly to mediation by small molecule concentration, the effects of some molecular activities on other activities are not strictly direct, but are mediated by a biological process. Key examples are transcriptional regulation, regulation by ubiquitination and degradation, and regulation via membrane depolarization. Where there is evidence that the transcription factor directly positively regulates transcription of the downstream gene, link its activity (e.g. DNA-binding transcription factor activity, RNA polymerase II-specific, (GO:0000981)) to the mediating process (e.g. positive regulation of transcription by RNA polymerase II (GO:0045944)) with part of, and the mediating process (e.g. positive regulation of transcription by RNA polymerase II (GO:00045944)) to the downstream activity (the activity of the transcribed gene product) with causally upstream of, positive effect. The equivalent model would be made if the transcription factor activity negatively regulates transcription by using the appropriate GO Biological Process term (e.g. negative regulation of transcription by RNA polymerase II (GO:0000122)) and the "casually upstream of, negative effect" relation between the transcription BP term and the activity of the downstream target. For direct transcriptional regulation, the target is added as a separate node and linked to both the activity (MF) and the transcriptional process (BP) using the has input relation. If it is not known if the transcriptional regulation is direct, the information may still be captured, but the target is not specified in the transcription factor MF nor in the regulation of transcription BP terms. If the mechanism of the causal relation is not known, use the more general causally upstream of relations (these can include a positive/negative effect, if known). Sometimes, molecular activities are composed of distinct subfunctions, and those subfunctions may even be carried out in distinct locations, or by distinct subunits of a complex. For example you may want to specify “hormone binding” in the “cytosol” as a subfunction of a nuclear receptor, that then activates (directly positively regulates) “transcription factor activity” in the “nucleus”. To specify subfunctions, you will create new activities and link them to an activity that you have previously created that describes the overall function of the gene product (e.g. “nuclear receptor activity”). Subfunctions (e.g. “hormone binding”) can be created using the Noctua form, but do not fill in the biological process field as it is the same as for the overall function. Once the new activity is created, link it to the overall molecular function you created earlier, by dragging (on the graph canvas) from the subfunction activity (blue circle) to the overall activity, and selecting the “part of” relation. You will then need to add evidence by clicking on the "part of" edge; a box will pop up; fill in the evidence fields and press the "Add" button. 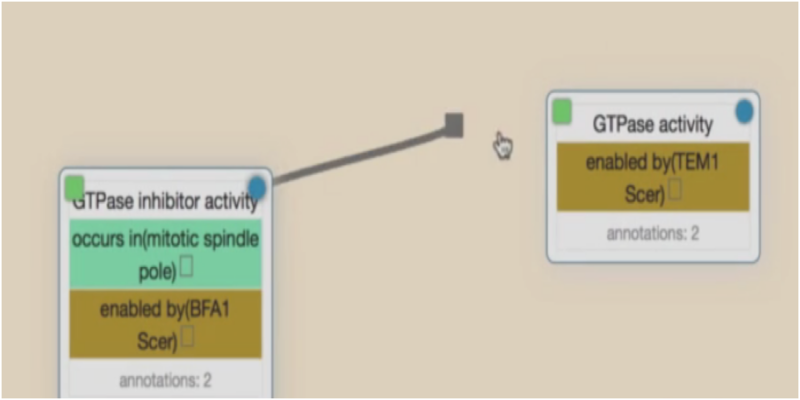 Editing can currently be performed only on the graph canvas (the simple annoton editor form does not pick up any operations you have performed on the graph canvas). Note that only one edit operation can be done at a time. To change something on the canvas, you will need to first ADD the correct part, and then DELETE the incorrect part, as separate operations. We recommend that you add first, so that you can transfer evidence from the incorrect part if necessary, by using the “clone other” operation. Relations can be removed by dragging the end of the relation arrow away from the box it connects to, into an empty part of the canvas. Relations can be added by clicking on the blue circle inside the upstream box, and dragging to the downstream box. Evidence for a relation can be edited by clicking on the relation arrow. To edit a simple box on the graph (no colored bars indicating that it has multiple parts folded together for easy viewing), just click on the green square. To change it, first add the new term by filling in the field under “add type”, and clicking add. Then reopen the box again and delete the old term by clicking on the red “x” next to it. To edit properties of an activity that are “folded” into the molecular activity box on the canvas, click on the green box in the corner of a box. Note that only one edit operation can be done at a time, so do not make more than one edit before pressing a button to save the edit. To change part of the annoton, you will need to first ADD the corrected part, and then DELETE the incorrect part, as separate operations. To remove a property of the annoton, click the “x” next to it. To edit the evidence, click on the “E” next to the part for which you want to edit evidence (e.g., the “E” next to enabled by is the evidence that the molecular function is enabled by the gene product). This is for annotations of where a gene product has been observed (but is not known to be active). Note that these annotations have a different meaning than using the default form: the gene product has been observed in the CC, but may or may not be active there. Use the "CC only" version of the form (select by clicking on the drop-down on the right that says "DEFAULT"). Fill in the gene product field. Fill in the cellular component field with the desired GO term, and evidence. This is for annotations that assert a relationship to a BP other than part_of, e.g. for regulates or causally upstream of relations. Use the "BP only" version of the form (select by clicking on the drop-down on the right that says "DEFAULT"). Choose the relation between the gene product and the BP. Fill in the biological process field with the desired GO term, and evidence. While you create or edit your model, you will see an asterisk appear around the "Untitled" text in your browser tab. The asterisk indicates that your work is not yet saved, and the "Untitled" indicates that you have not yet named your model. To name your model and save your work, click on the drop-down menu under the Model heading and select the "Edit Annotations" option. In the "Title" section, add a title for your model. The beginning of the title will now appear in the browser tab. To save your work, click on the Model heading again and select the "Save" option. Your work is now saved and the asterisk in the tab will disappear. Save your work often while editing! This allows curators to work on a model over a period of time, perhaps review them with colleagues or experts in the field, and then publish them to the GO or other web sites. When ready, curators have the ability to explicitly change the production status of their model. To do this in the Simple annoton editor, select "Production" from the State drop-down to the right of the model title. To do this, in the graphical editor, click on the Model drop down menu and select "Edit annotations" from the list. Under the "Annotation state" section, delete the "Development" status. Return to the Model drop-down, select "Edit annotations" from the list and under "Annotation state" select "Production" from the drop-down list. Bug reports and requests for new features should be entered on the GO's Noctua issue tracker on GitHub. Before entering a new ticket, please be sure to search the tracker to see if the bug or feature request has not already been reported!